Broken posts – For the fainthearted . . . The flock were moved from the field yesterday. The metal gate still hangs from the remaining upright post, the other post lies on the ground, snapped off at ground level. 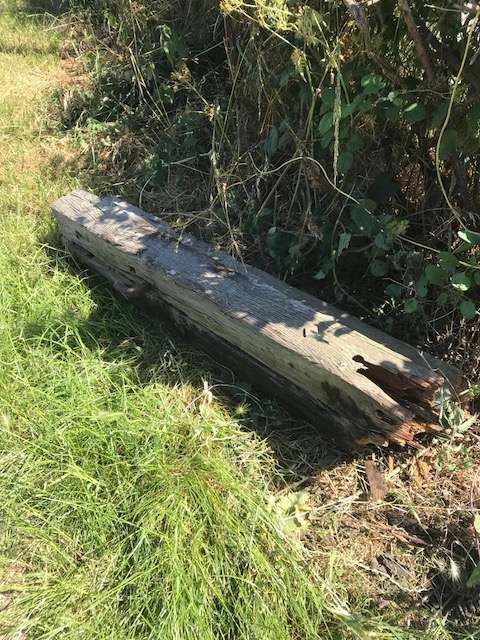 In the years since the former railway sleeper was driven into the ground, it has slowly been eaten by a rot that has led inexorably to the post’s fall. There was a moment’s sadness looking at it lying on the ground. The gateway had been a meeting place for children from the road. The gate had been vaulted by the athletic; it had been opened by those intent on two a side football matches; it had been the safe place in games of tag. A memory lingers of a group of children lined up against the gate while one of their number stood in the road thinking of the initials of pop songs or groups, the first person to run forward with the answer then asked the next question; knowing only “HH” for “Herman’s Hermits”, it was a game in which I did not get to stand in the road. Decades of activity contributed to the weakening of the post. Perhaps it will now be be cut up for use as firewood, perhaps the rot will be trimmed away and the post used in the repair of a fence, or in closing a hole in a hedge. Of course, the gate remains, but it is much more recent than the days when Sunshine Girl was on the BBC Radio 1 playlist. It is the posts that create a gateway, without them a gate is no more than a fence, a barrier closing a space. Posts might have initials carved into them, or scores recorded in chalk. Posts were coat hooks and bike stands and uprights against which to lean, one foot flat on the floor, one against the wooden surface, in a futile effort to appear cool and composed. In many Nineteenth Century churchyards and cemeteries there will be found a grave, perhaps more than one, where the memorial stone is a broken pillar. The life of the deceased is felt to have ended prematurely, to have been shortened as a column split in two. Remembering those who lived in this place, who tolerated the noise of rowdy children, who turned a blind eye to the use of their fields, who drove warily along a road that was a playground, who must at times have been bemused by the behaviour of the younger generation, the broken post seems as strong a symbol of mortality as the polished stone of graveyards. You know that’s just amazing. 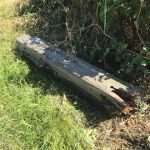 We had railway sleepers on the farm when I was growing up too. My grandfather bought them when the Clonmel to Thurles via Fethard line closed. And some of them were heavy beggers too. But I’ve not seen a real one in years, and amazing that one lasted 50 years at least since that line near you closed. Our local stations closed in 1964, I remember going with an uncle to collect flag stones from a halt at Thorney on the Yeovil to Taunton line.Sleepers were very solid – and very heavy!